David Carr got back to his record-breaking ways at WAAS last night with a new pending world record in the 2000m steeplechase of 9:35.1, taking 3 seconds of his previous mark. Jim Barnes will be holding marathon training sessions at 6am McCallum Park every Saturday morning. All members welcome. Bunbury gears up for the annual City versus Country clash. Two MAWA athletes star at AMA multi-event championships in Bendigo. Entries to close soon for State championships. Steve Weller featured in this month’s profile. Final wrap on the Patron’s Trophy events. WAAS will be unavailable for MAWA competition on Tuesday 15th January and Tuesday 12th March. Apologies for the late notice for next week, but the VenuesWest system that gives us early advice had not been updated for 2013. The current club financial year ends March 31st, and this causes problems because the major income/expenditure during our state championships spans two different financial years. The committee intend to present a resolution to this year’s AGM that will change the club’s financial year to 1st July to 30th June. The membership year of 1st April to March 31st will remain unchanged. In practical terms the only change that members would see would be that the AGM would go back to late July. 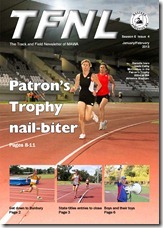 The January Vetrun is now online. Either go to the Magazines tab, or click on the link at the bottom of this sidebar. Bunbury Regional Athletic Club is holding 2 competitions in January and February and have invited MAWA members to join them. This is a great way for extra competition before the State T&F Championships and to support the Bunbury athletic community, who always come up to Perth in large numbers for the State Championships. Both events held at BRAC, Hay Park, Bunbury, starting at 3.00pm, followed by light eats. Contact Val Millard (mawasecretary@gmail.com) or on Tues or Thurs for more info and to advise if you plan to attend, for program/catering purposes. On line entries now available. Go to https://sites.google.com/site/ama2013canberra. Entries close 22 Februuary 2013. No late entries accepted. John Oldfield and Dave Wyatt will be running 3 high jump events at ECAC in early 2013. These will be on 10th January, 31st January and 21st February.